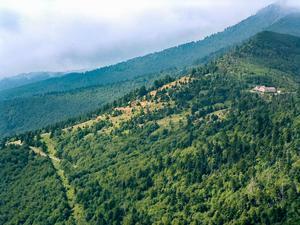 At the crest of the rugged Black Mountains rises the highest peak east of the Mississippi River: Mount Mitchell. 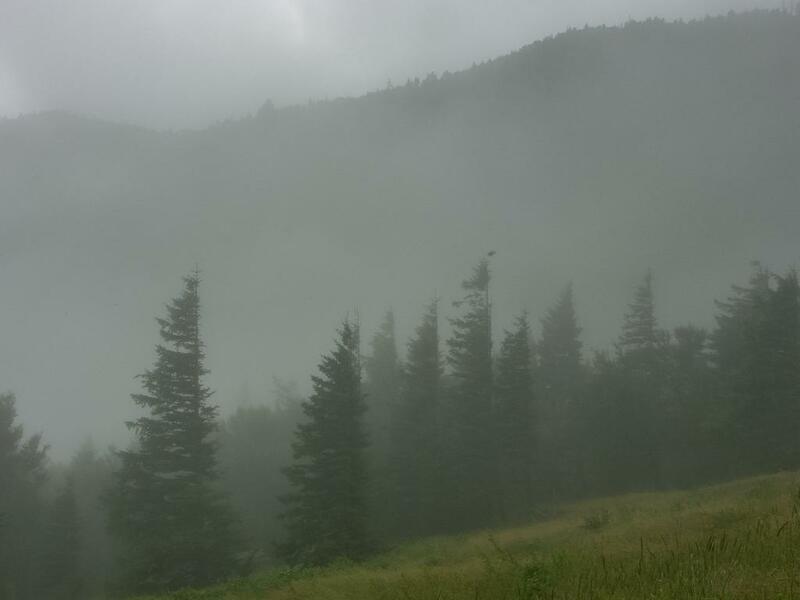 Created by the state in 1915 to protect the last stands of virgin timber on the mountain, Mount Mitchell State Park encompasses an environment more like that of Canada than the Southeast. 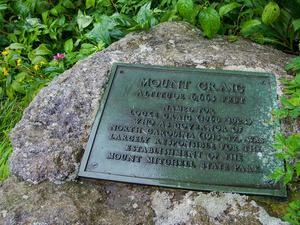 The summit of Mount Mitchell is marked by this sign, the viewing platform, the grave of Dr. Elisha Mitchell, and views in all directions. Fog surrounds the spruce-fir forest around the end of the Commissary trail, looking toward the junction with Buncombe Horse Range Trail and the top of Commissary Ridge. Named for the dark spruces and firs that drape the highest mountains, the Black Mountains contain over 20 peaks that surpass 6000 ft in elevation. Although not as long or wide as the nearby Blue Ridge or Great Smoky Mountains ranges, the Black Mountains are indeed the highest. A variety of hiking trails wind throughout the park and onto surrounding Pisgah National Forest land in the Black Mountains and Toe River area. 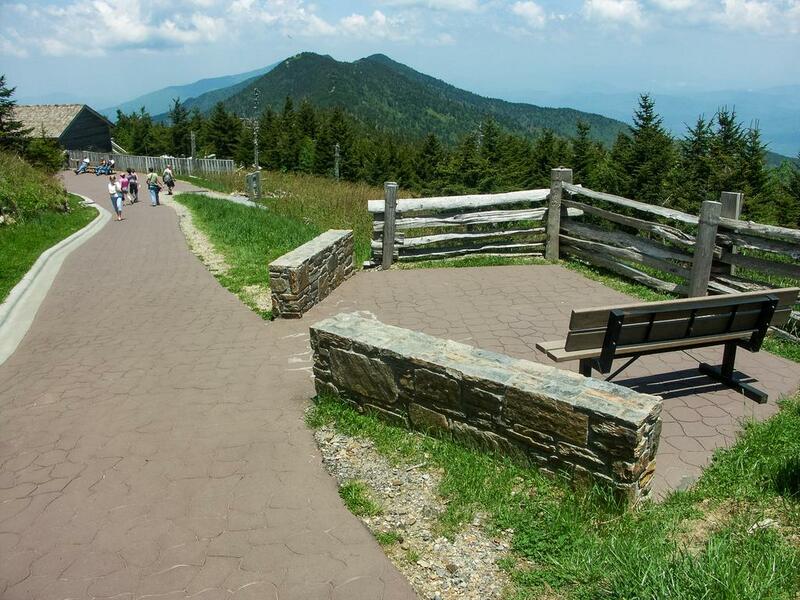 From the summit parking area, the paved, accessible summit path leads to the observation platform at the peak's highest point. 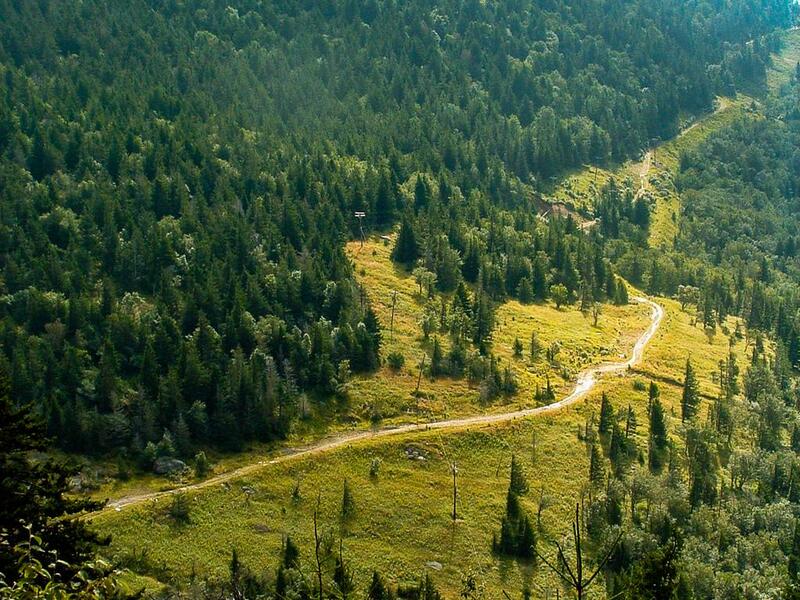 The Balsam Nature Trail connects to the summit path, combined to make an easy loop in the spruce-fir forest in the highest elevations, and it's a great addition to a summit walk for families. You can also take a longer and more authentic - yet not too difficult - hike to the top of Mt. Mitchell. 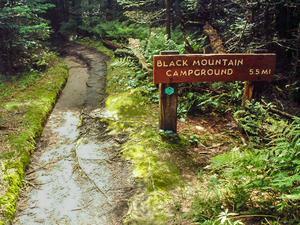 Starting at the park office, two trails lead further into the park: the easy Commissary trail which goes to Camp Alice, and the Old Mitchell Trail which goes to the summit. From Camp Alice, you can take the Camp Alice trail which goes from there to the summit. 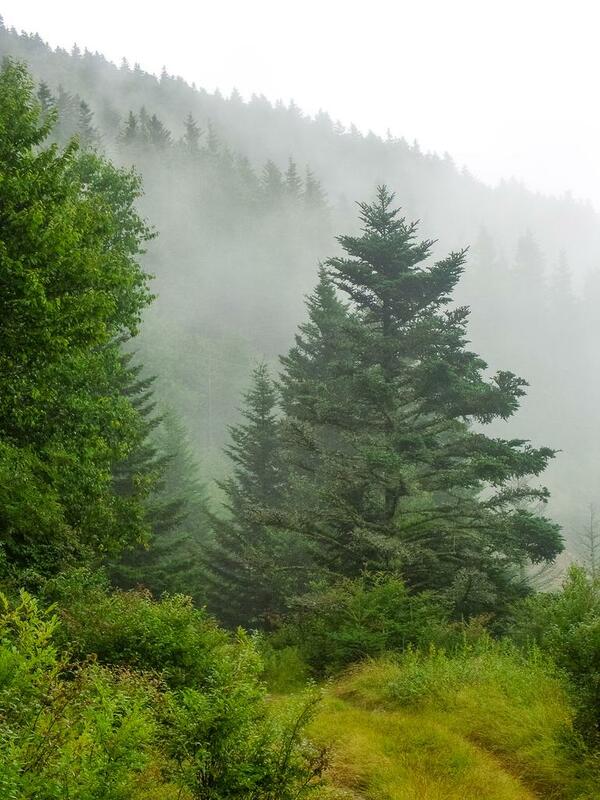 The start of the Black Mountains Crest trail passes through a dense spruce-fir forest on an easy route. A loop hike combining these trails is one of the best in Western NC, so we've described it in detail as the Old Mitchell Trail hike on this site. You can also access the Old Mitchell trail closer to the summit from either the park's restaurant or the park's campground. From there, you can connect with all other trails in the park. Looking for a longer, more difficult journey? 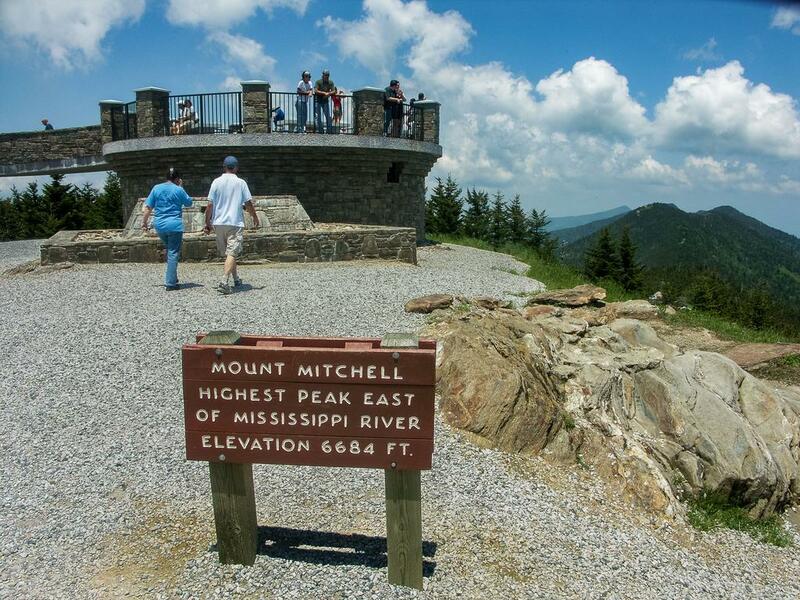 The Mount Mitchell trail starts at the summit path and descends 3000 ft. over a course of 5.5 miles to end at the Black Mountain Campground on the Toe River in the valley below. Along the way, it intersects the Buncombe Horse Range Trail mentioned above. 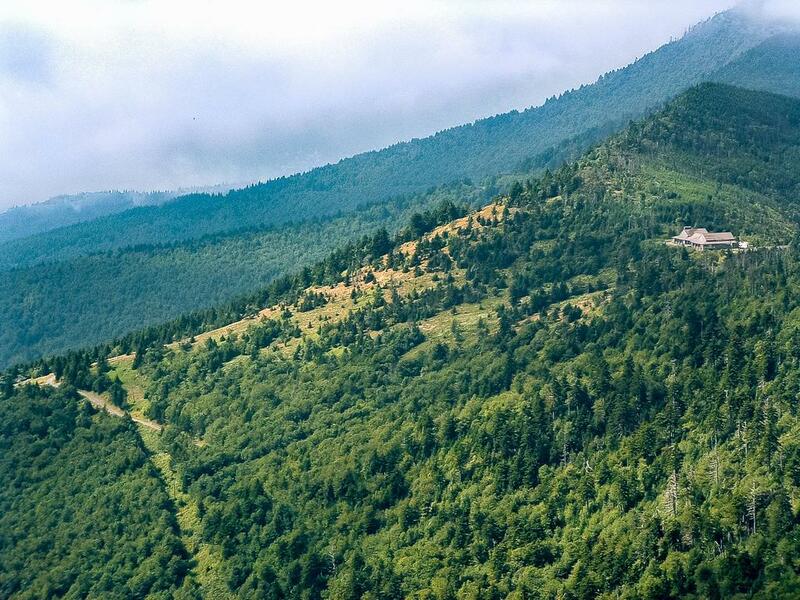 Most hikers start at the campground and go up first to reach the summit to experience one of the best hikes in WNC, and that's the Mount Mitchell hike on this site. Another doozy of a trail, the Black Mountain Crest (Deep Gap) trail, leads from the picnic area out along the ridge top, crossing over the second highest peak in the Appalachian Mountains on its way: Mount Craig. Don't let its easy beginning fool you - this trail quickly becomes quite rough as it passes through Deep Gap and onto Pisgah National Forest lands, connecting with several others trails along the way, and then descends the mountain range to end in the valley far below. Finally, the Mountains to Sea Trail follows a route through the park, co-signed along parts of the Buncombe Horse Range, Camp Alice, and Mount Mitchell trails as part of its longer journey from Clingman's Dome in the Great Smoky Mountains to Jockey's Ridge on the Outer Banks. This is just an overview of what trails are available. For details on each individual trail accessible from the park, visit the trails page, or for a more complete guide, see the Best Hikes in Mount Mitchell State Park which use these trails. Visitors to the park can enjoy several amenities before and after they hike. Upon entering the park, stop by the park office for information, maps, and restrooms. This is also the starting point for the Camp Alice and Old Mitchell trails. The office is staffed during business hours and they'll be glad to answer any questions you might have about the park, trails, or current conditions. The Mount Mitchell Restaurant is perched above forest and open fields below. Open from May to October, the restaurant offers great food with an incredible view! Check out the fine selection of Mount Mitchell branded souvenirs as well - even seasoned hikers can hardly resist a little something to show their love and support for the park. While you're parked here, consider a hike after your meal, either up to the summit, down to the park office, or a loop that connects the two. At the summit parking area is a 40 table picnic area with two picnic shelters. Each table has a grill. Handicapped accessible tables are available as well. Also at the summit is a concession stand offering snacks, drinks, and souvenirs. Next door to it is the gift shop, where you can get some more of those books and T-shirts. Restrooms are located down the stairs. 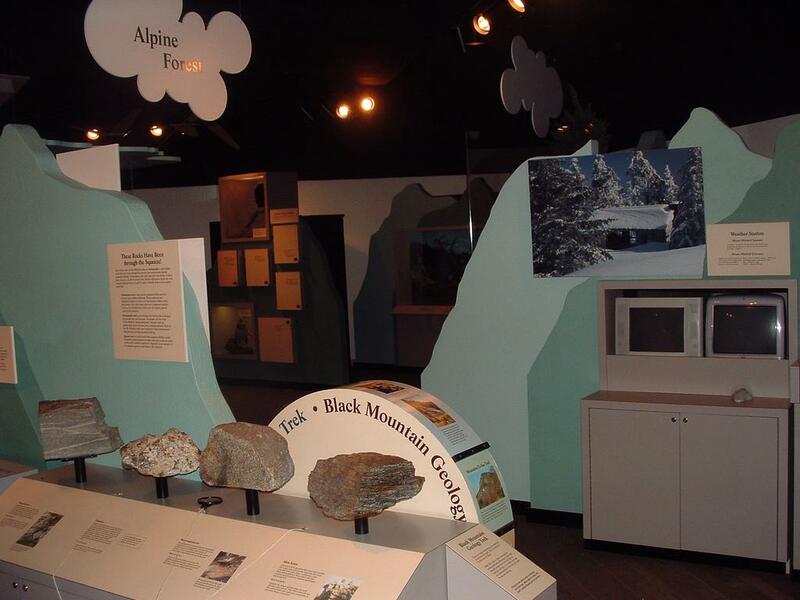 The park's museum has a great selection of displays featuring the park's natural and human history. Discover some of the geology that went into building the mountain peaks, and get more information on the the unique plant and animal life that lives there. While you're in the summit area, hike the short, paved path to the new observation platform at the very peak, which replaces the old 40' tower which used to stand there. The mountain, park, and nearby waterfall are named for Dr. Elisha Mitchell (1793 - 1857), a professor at UNC-Chapel Hill. He made several trips to the area over his lifetime to painstakingly measure the mountains' height using barometric altimeters. Over several subsequent brutal excursions up the mountain, he arrived at a final determination of elevation at 6,672 ft. - a mere 12 feet shy of the actual elevation! 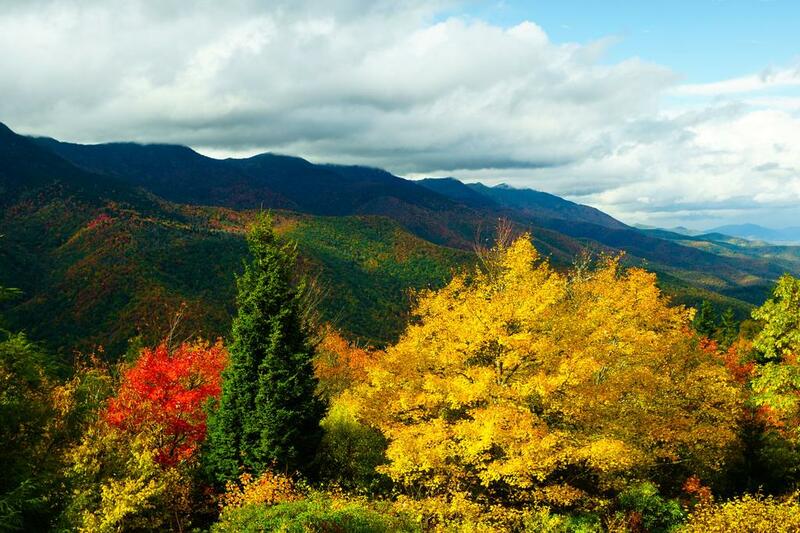 The Black Mountains as seen in fall color from the Mount Mitchell overlook. Controversy arose between Dr. Mitchell and others as to which peak in the range was actually the highest, or whether a peak in the Great Smoky Mountains or in the White Mountains in New England was higher. Mitchell died after falling from the top of a 20 foot waterfall while descending the mountain through thickets of trees and rhododendron on a later trip to settle the argument. It is settled today: at 6,684', Mount Mitchell is indeed the highest. By the early 1900s, logging denuded much of the Black Mountain range including the lower slopes of Mount Mitchell. By 1913, citizens began to voice their alarm. On March 3, 1915 Locke Craig, governor of North Carolina from 1913 to 1917, signed a bill establishing Mount Mitchell as the first state park after it quickly passed through the legislature. 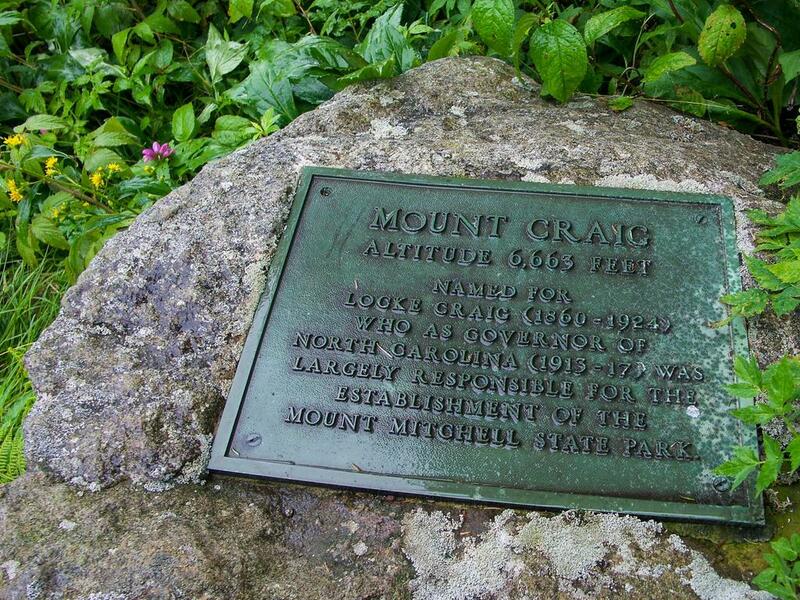 The second highest peak east of the Mississippi (6,647 ft., one peak north of Mount Mitchell on the Black Mountain range) was named Mount Craig in his honor. For extensive additional historical information, see the official State Park web site's History page or visit the park museum. Current view from Mount Mitchell. 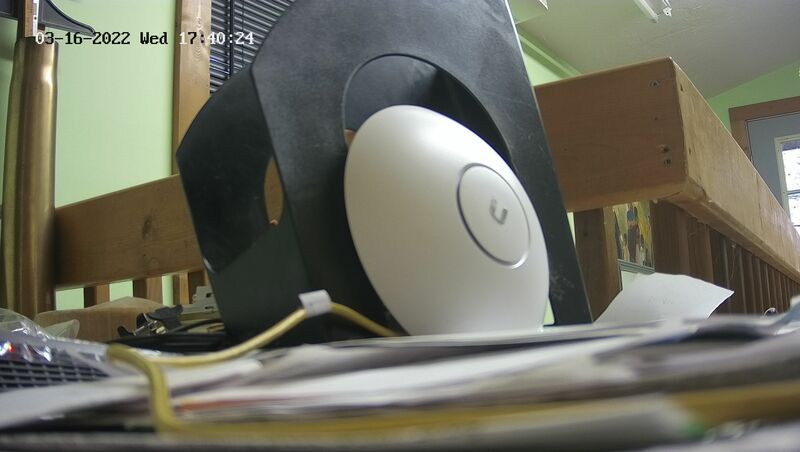 Image may be obstructed by fog, ice, or snow. 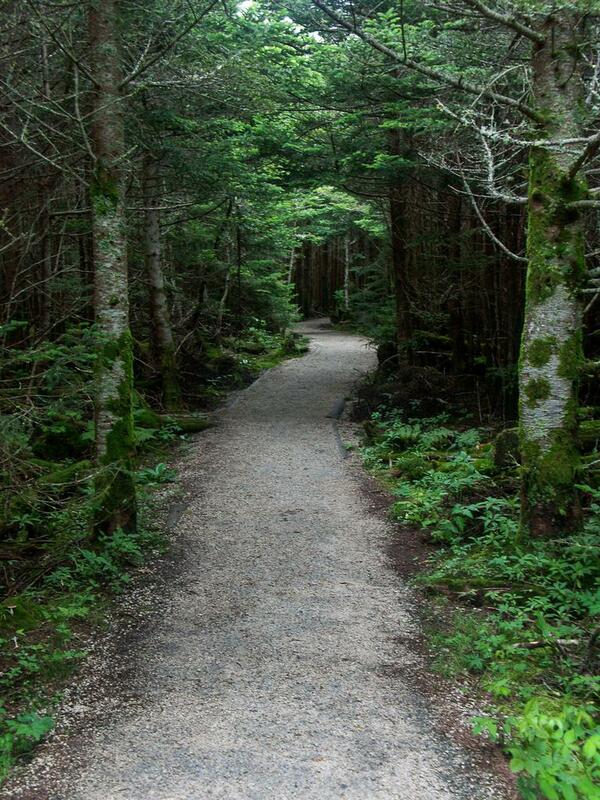 Provided by Friends of Mount Mitchell State Park in association with North Carolina High Peaks Trail Association. Here's the image from the Mount Mitchell web cam from near the summit, as well as a link to Mount Mitchell current weather information. (Friends of Mount Mitchell State Park in association with North Carolina High Peaks Trail Association). A nine site, tent-only campground is located about 2/3 of the way from the Park Office to the summit. At 6200 ft elevation, this is the highest developed campground in Western NC! The campground offers level tent pads, with fire rings, lantern poles and picnic tables at each. There are some shady sites in the firs and a couple of sunny ones without tree cover. Water is available at several spigots around the campground and restrooms with flush toilets are available. The campground is open from May 1 - October 31 (weather permitting). It will close earlier in October if freezing temperatures arrive. Thus, reservations are available only until October 15. Call ahead to be sure the campground is open. It is recommended to make a reservation before you go by visiting the NC State Parks page on ReserveAmerica. After October 15, reservations are not available. Any unreserved sites, and all site after October 15 until the campground closes, are available on a first-come basis. If the campground is full, overflow camping is available at one of several nearby campgrounds on the Blue Ridge Parkway. 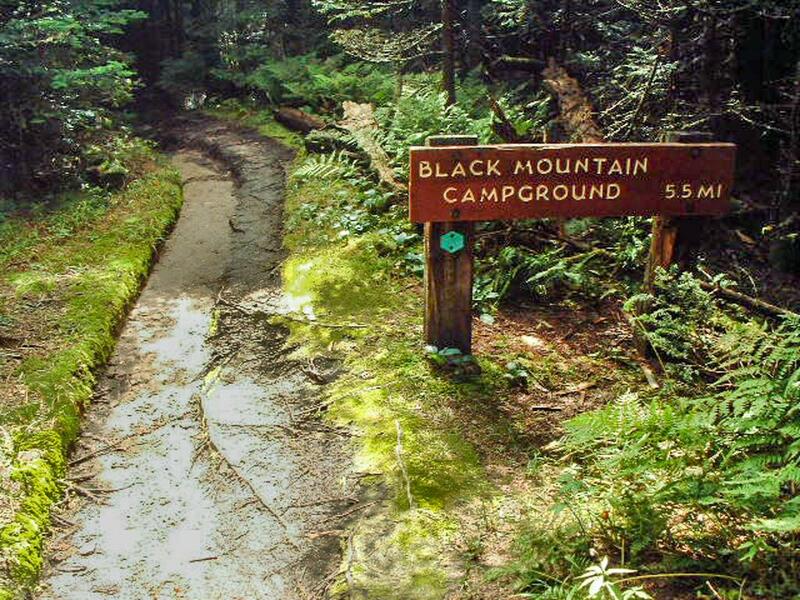 For a lower-elevation camping experience that accommodates RV's, check out the Pisgah National Forests's Black Mountain Campground in the Toe River area at bottom of the mountain. 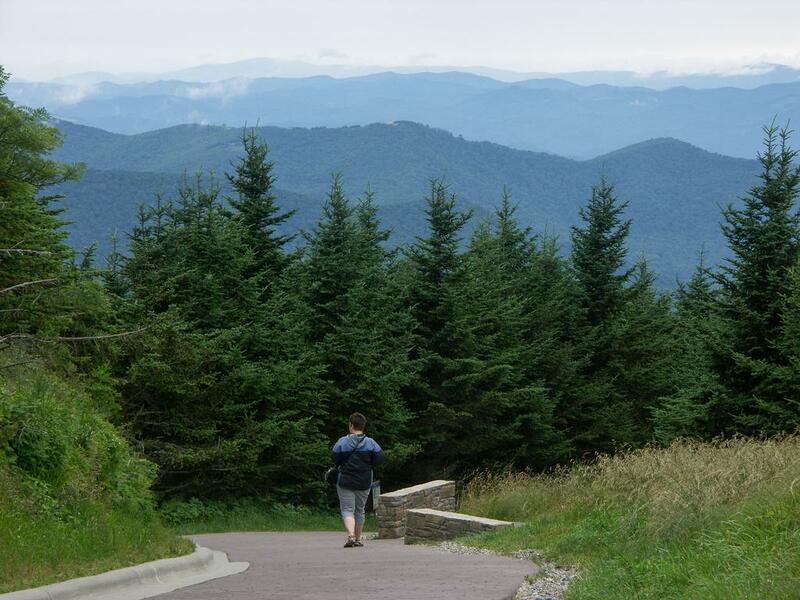 It's connected to the State Park via the Mount Mitchell Trail or by vehicle shuttle on the Blue Ridge Parkway. Sites range from $18/night in the summer to $12/night in the winter (with no running water and portable toilets only). This is usually the recommended alternative if the park campground is full. No backcountry camping is allowed outside the campground within the state park. However, there are excellent backcountry camping sites on adjoining Pisgah National Forest lands and trails. Two of the most popular are at Comissary Ridge and Deep Gap. To use one of these sites, make sure you've obtained an overnight parking permit if you're parking inside the State Park. These are available for free at the park office. Sitting under huge oak tree and across from trout stream in Pisgah National Forest, Serendipity Cabin is a fortunate discovery! We're located at the base of Mt. Mitchell and within walking distance to the Mt. Mitchell Crest trailhead. Fish or go tubing in the South Toe River or play a round of golf at the Mt. Mitchell Country Club. Enjoy a scenic drive on the Blue Ridge Parkway, just 10 minutes away. The perfect combination: isolated but not too far from civilization. Amenities include: a wood fireplace, phone, a/c, satellite TV, VCR, stereo, DVD/CD player, full kitchen, microwave, dishwasher, fridge with ice maker, cooking utensils, W/D, BBQ charcoal grill and Internet Access. The iconic tower atop 6,684' Mount Mitchell has been removed and the new observation deck atop 6.684' Mount Mitchell has opened. It was originally scheduled for completion in 2007, but was finally finished around November 2008. As of January 2009 notices on the Park's web site regarding closures around the construction site were removed, and a visit in February confirms that the summit has reopened. The short, round deck replaces the aging concrete and stone tower which was torn down a couple of years ago to make way for the new structure. From Asheville, take I-240 East to US 74-A East to the Blue Ridge Parkway. Exit right; turn right at the end of the ramp and drive North on the Parkway about 30 miles to NC 128 (there is a large sign for the State Park). Follow NC 128 for about 3 miles to the Park entrance; the summit is another 1.2 miles ahead.